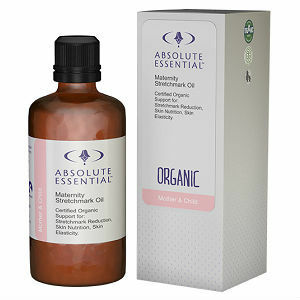 This is a product review for Absolute Essential Maternity Stretch Mark Oil (Organic). This product claims to contain a premium blend of organic ingredients that reduce stretch marks and provide the skin with essential nutrients. This oil also claims to maintain elastic skin. Read further to learn more about this product and its suitability. Palmarosa Cymbopogon martini- used to stimulate the regeneration of skin cells. Calendula officinalis oil (Infused)- helps in maintaining a youthful and elastic skin. Mandarin Citrus reticulate- plays a significant role in stretch mark prevention. It also increases circulation to your skin and reduces fluid retention. All ingredient used to make this product are certified organic. Apply every day in the course of pregnancy. Apply to areas that are susceptible to stretch marks such as the belly, breasts, and thighs. You can also use this product during the postpartum period (immediately after birth) to boost recovery. In addition, you can apply to old stretch marks to stimulate restoration. This oil is also silky and smooth making it an ideal product for a pregnancy massage. In case of ingestion, consult a medical professional. Avoid eye contact and if this product comes into contact with the eye, consider flushing with water. The manufacturer claims that this product is safe if used as directed. Given that it contains natural ingredients, it is unlikely that users will experience unwanted effects. One bottle (100 ml) of this stretch mark oil costs $39.95 on the product’s official site. One 500 ml bottle costs $99.95. This is a relatively high price. Nevertheless, it could be a sign of high quality. We did not find any price discounts for buying this product in bulk. We did not come across any information about a satisfaction guarantee for this product. A guarantee is important because it proves that the manufacturer is sure of the product’s efficacy. Without a guarantee, potential buyers might be skeptical about the product. We did not find any valid reviews from users. Without these reviews, some customers may question the effectiveness of this product. In conclusion, this product is worth trying because it contains ingredients that have the ability to reduce stretch marks and rejuvenate your skin. We have identified several benefits associated with this product. For instance, it comes from a certified organic manufacturing facility. In addition, this product is safe for pregnant women and unborn children. However, this product is relatively expensive making it difficult for some consumers to afford. Furthermore, there are no customer reviews to ascertain that users are satisfied with the outcomes. Moreover, this product has no satisfaction guarantee. David Carney	reviewed Absolute Essential Maternity Stretch Mark Oil	on August 15th	 and gave it a rating of 2.5.